With the exception of a couple of very poor VHS copies on Amazon, no seasons of Lou Grant have been officially released by the studio. 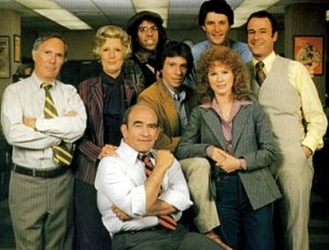 Trading comedy for drama in this spin-off, the gruff newsman Lou Grant from The Mary Tyler Moore Show made a new start as the city editor of a Los Angeles daily newspaper. Instead of situations that made us laugh this new series tackled controversial and topical subjects and was voted by newspaper journalists as portraying the most realistic newsroom ever on television. Lou Grant was still wonderfully portrayed by Ed Asner who rode roughshod over reporters Art Donovan (Jack Bannon), Joe Rossi (Robert Walden), Billie Newman (Linda Kelsey) and photographer Dennis “Animal” Price (Daryl Anderson). Lou’s boss was managing editor Charles Hume (Mason Adams) and the owner of the newspaper was Mrs. Pynchon (Nancy Marchand) who often butted heads with Grant but always with an air of mutual respect. Lou Grant won 13 Emmy Awards, including “Outstanding Drama Series”. Asner won two Emmy’s for his portrayal of Grant; Marchand won an Emmy for “Outstanding Supporting Actress in a Drama Series” four of the five years the series ran; Walden, Kelsey, and Adams all received multiple nominations for supporting Emmy’s. Knowing that the show was being canceled a final episode in which the paper shuts down was envisioned and even researched for authenticity however the studio pulled the plug on the show before it could be filmed. Rumors swirled that Asner’s left wing politics rubbed the studio execs the wrong way but like most rumors it was strongly denied and eventually died away. Lou Grant was considered, by many, to be the most insightful and intelligent show on tv at that time. When the series aired on Monday nights, journalism classes would dismiss early, so that the faculty and students could watch the new episodes and then have a classroom discussion about the episode.